Very Rev. 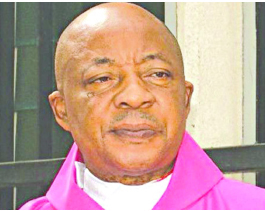 Monsignor Gabriel Osu is a great social communicator, an administrator and the incumbent director of Social Communication for Lagos Archdiocese Catholic Church. He has delved into the state of the nation and condemned the neglect of people of the South East, as if they are not Nigerians. In this interview with VERA WISDOM-BASSEY, he spoke on various issues. President Muhammadu Buhari’s administration just clocked two years, as a renowned clergy, what is your assessment of the journey so far? Anyway, we should be patient. They promised us four years. If we’re in two years, we cannot give pass mark or fail. We’ll wait till four years and at that four years through our vote, we’ll be able to say ‘we’re tired. We don’t want you again’. If we want to give them mark for this two years and I say 50 per cent, they have struggled in terms of security, Boko Haram, they are still struggling on it. But they have done a lot, the zeal and the will for a better Nigeria is there but we want it to go from lip service to action. That is why I say we should be patient. The next two years is almost at hand. We want their magic wand before that two years. How long should we be patient? You gave them four years mandate, so be patient for the four years. And the only way you can remove them is through the ballot box. Yes, Nigerians are hungry; we are in a recession. You are a media person, you know what a recession is; economic downturn, because when we had oil boom, instead of investing, saving, we were spending. Former President Yakubu Gowan even said that ‘our problem is not money but how to spend it’. We paid salaries of some countries, even the Caribbeans. So, we were living an ‘I don’t care’ manner, but now we care. Nobody is coming to assist us, we only hope that this hunger will make us look deep, think deep and act well. In what way can we look deep, think deep and act. What should be the immediate solution to this recession? What immediate? There is no magic to be done; if you plant yam today, will you get it today? Even if you sell oil at $100 per barrel, will you eat the Naira or drink the oil? That is why I said we have to be patient. Invest, then patience, and things will come out. Talking about this investment, does it pertain to individual investment, private investment or as a nation? Both individual, private and then the nation; our problem is that the nation for now does not even know what to invest on. They are talking left, right and left again. They are not serious, because we have square pegs in round holes. I don’t mince my words. I know what I’m saying very clearly; square pegs in round holes. And as long as you have that, we can’t move forward. We’ve been talking about restructuring, bringing good governance to the grassroots, agriculture and all kinds of things. But it appears it is all lip service. That is our situation. We are not ready to work. And once you are not ready to work, you cannot really eat. So that is our situation. It’s becoming a real problem; this issue of people not ready to work. But is the work there? Our youths want to be rich over night, like their elders. Our elders got rich over night, nobody asked questions. See the money they are getting from all those formerly in government-billions. So, tell me, who now wants to till the ground? In European countries, even the drug barons in most Latin American countries, when they steal, they invest it around their place and around their people. But Nigerians steal and take the monies to foreign banks. Their wives won’t even know where the money is. And when they die, everything dies with them. We don’t invest. See the people they are collecting billions from. What is their investment? They buy houses outside the country, building in Abuja, some building houses for money. That is no investment. You can count our investors with fingers- Dangote and a very few others, as if they are the only Nigerians that are rich. We have people that are richer than them, but they don’t invest. So, how do you move forward? Recently, the Acting-President was accused of nepotism in making appointments to his office. What is your reaction to that? Thank God he has refuted it or do you have proofs! The proofs are there, like that of Dr. Okey Enilamah and the rest? (cuts in) They should be the last people to even talk. Even when they say northerners, you would think that it is the general northerners, but its people from Katsina and all those areas. Anyway, Nigerians, I can say we are not serious. If you go to England now- Theresa May, do I know her village? Do I know Donald Trump, his village or his people? Why have the white people not raised an eyebrow to the French President who married a woman old enough to be his mother? Do you think it can happen here? Because we chase shadows, we can’t deliver, we cannot move forward, that’s our problem. As a nation, we have the capacity to excel but seem to have failed in all indices. How can we solve this? We have square pegs in round holes. That is our situation. Our leaders, without mincing words should not be leaders. But unfortunately, they are our leaders. If somebody steals, they come and people clap for them, and say ‘welcome sir’. If you steal one Naira now in your family, they will flog you. They’ll say ‘is it only one you see’? ‘What of one billion? You are here now, people who go to prison, they come back and they clap for them. Apart from clapping for them, they even make them president and head of state. So, where do you go from there? You go to Ghana, Cotonou, I am not talking about America, things are not like that. We’ve lost touch. No morality, no common sense again; it’s all operation pack as you can and go. That’s sad enough. So, what makes a qualitative leader? Good governance. He does not have to have PhD, but good governance, common sense, fear of God, first and foremost. If you have fear of God, good human management and you are ready to die for the cause of the masses. Our problem again is tribalism, quota system. Where you put merit under the table and promote quota system. Where are you going from there? Take a look at US, they get the best brains from anywhere. Any person can hold key positions there once they know you can deliver. But here we play silly politics, and place into key positions people that know next to nothing. How do we promote morality in the country? Even the school curriculum now, you have the secondary schools and junior schools. I’m a catholic priest, the Christian Religious knowledge (CRK) which emphasises the fear of God, the teaching of morality, is it encouraged now? It is not encouraged. Now, anybody can teach it, whether you are trained or not, and it’s just certified as any moral studies. Now emphasis is now coming to Arabic teaching, Arabic learning; Islamic studies are good. But when you try to water down education level and moral level, this is the result of what you get. The current curriculum in federal schools now is falling. Religion is thrown to the background. CRK is never encouraged, rather Islamic/ Arabic studies all over the place. You read between the lines and you’ll know where these people are going. And I keep on wondering whether our so called educated people, our so- called Christian leaders, moralists, even the Senate and House of Representatives do not see this thing. Or they don’t know what is happening. If they are not sleeping, there are many things they should be challenging and passing law against. They are just there fighting either for personal interest, going to court every day and merry go round. No head, no tail. What is your view with regards to the fact that our leaders do not have a well- driven development plan? They are talking of 2019, not today. It is we that are thinking of hunger today but they are talking of 2019. How to be rulers, not messengers. That is the situation. We worship money, and people who worship money cannot grow. How do we curb this menace from affecting the youth? We need to choose the right leaders. What we have in our local governments is crass show of naked power and power show. But we need to engage the youth. But how do we do that, when the atmosphere is so rowdy. But I believe that we’ll come out of it, one way or the other, we’ll come out of it. We cannot continue like this forever. It’s a big message. From what they are saying, there is no federal presence there since after the war; even when the government then declared no victor, no vanquished. In the East, there is no government presence, so that is the fight. They are deprived of everything. It’s as if they are not Nigerians. If everything is there as it should be, they have good roads, and other amenities, who will be talking of Biafra. But there is no federal presence. If one quarter of the money used in developing Abuja, the North and other different parts of Nigeria was spent there in the East, then they will know that they are Nigerians. I’m not advocating violence, but what is happening there is because there is no federal presence, hence the people are registering their anger. And as they say ‘anger is a bad counselor’. It does not lead to any good thing. But that’s what is reigning supreme over there for now. We pray God to bless us. Are you justifying Biafra agitation? Do you envisage Nigeria disintegrating? I am asking this because currently, agitation for Biafra is on one side, while the quit notice by the Arewa youths is on the other side? Let them manage the resources well and everybody would be happy. I think it is the mismanagement that is causing the agitations? That is why the youths are angry. If they have job satisfaction, and even those who seek those jobs are working, then things would be stable. There is no state in this country that does not have resources from coal to gold and then crude oil. If they manage these things well, there will be no cause for alarm. But individuals amass so much monies and don’t even invest it, rather, the monies go to one bank. Thank God they are seizing the money overseas, but again they are building houses for money. According to EFCC, they even have coffins where they store their money. Does this not show that something is wrong with our brain? The stay-at-home held in the South-East and you said it has a message. It has a message! Do you think the government is happy? Can you quantify the losses incurred by civilians, ordinary people and the government for that day? It was a big message, and it shows that all is not well. By the time others start imitating that sort of agitation, things will fall apart. So, we have to look carefully and quickly into the agitations. Government should quickly look into these Biafra agitations? Not only Biafrans but to Nigerians. Are they not fighting in Rivers? And even in Yenagoa, and some parts of the North? So, they should look into all the issues raised. What is your take on the killing in Southern Kaduna? What do you want us to do? We are not the police that would go and fight. We cannot carry machine guns and fight. But we’ll continue to talk and call on the government to do something; they have the power. But we hope they won’t wait until it gets out of hand. That is the situation. The Acting-President has been on the move, visiting different parts of the country, and talking to various groups on diverse issues, do you think his efforts would bring a lasting solution to the agitations including that of the Niger-Delta militants? At least he’s talking with them. And that is what they want. They are dialoguing, ‘drop your arms. This is what we’ll offer you’. So why would they be fighting? But if they wait for two years and keep hearing grammar only, then you have a problem. At least they’ve seen in him, somebody that is ready to dialogue and push them forward. Work and pray, that’s it. Then our leaders should be good leaders. We are not asking for rocket science leadership, but just the basic amenities-water, food, power supply, good roads. The Lagos governor- Ambode seems to have some idea of what governorship is. If at the federal level they have the same idea, we would know they are moving forward. But unfortunately, we talk too much grammar and less action. What do you have to say on the raging issue of the quit notice given to the Igbo by Arewa youths? As we are being challenged, the responsibility of articulating and writing the stand of Christians and their vision falls on my shoulders. I am not in any way suggesting that we act like our brothers on the other side- the people declaring quit notice. No, it shouldn’t be so, because it will only lead to anarchy and disintegration. I was a young boy during the time the Nigeria and Biafra civil war was fought, and I saw the pains and sufferings it brought. In Lagos, I knew when they were looking out for the Igbo and hanging them in the streets. I was lucky I was in school in Ibadan. My parents were not abducted too but they were lucky to be alive. Many people I knew lost their lives. So with this statement by this our brothers in the North, all that they have succeeded in doing is taking us back to 1966. This was exactly the same vocabulary, the same action that happened. The killing of the Igbo in the North; and when their corpse were brought back home, Ojukwu who was governor of Eastern region then declared Biafra and from there, the civil war started. Unfortunately, we have forgotten nothing, and learnt nothing. Fifty years on, we are still talking of the same thing. All we have is glorified democracy on paper, because it is purely unitary government. And I thought Aguiyi-Ironsi was killed too partly because of his unitary kind of military government. But unfortunately, the real beneficiaries are the ones holding tight to it, that they are not moving anywhere, they are not bulging. And like I’ve said in the news, the Federal Government should nip this in the bud, the people who said these things, are not strangers, they are known all over. Even what these people have said is more dangerous than what Nnamdi Kanu said, yet up till now that I’m speaking, I don’t think any arrest has been made. I don’t think any arrest or action has been taken. Instead, those who are supposed to be elders seem to be encouraging them, but I thank God, the governor knows his onions. So, he should do what he should do. Also some of the sensible governors should do what they are supposed to do. Then my candid advice is this. The 2014 national conference they had has solution to many things worrying us. Unfortunately, our leaders are deaf, they don’t appear to listen. It appears they have monopoly of knowledge. They prefer talking down on the people; nobody is listening to the masses. They select who they listen to. But I believe the ordinary Nigerians are not tired of living together either in the North, South, East or West. They want to continue doing things together. But political leadership is our bane. People who have been feeding fat from the government coffers, they seem not to be ready.